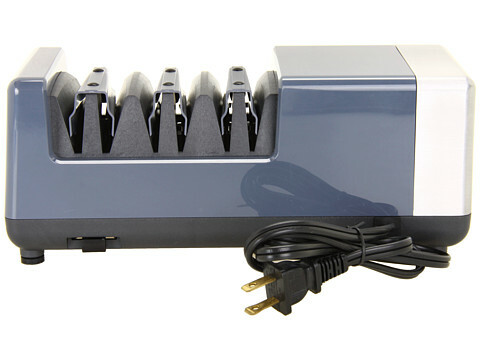 This Wusthof electric knife sharpener was manufactured alongside “Chef’s Choice” who are world renowned for producing high quality kitchen products for the home cook and professional chef. Chef’s choice produced their first electric knife sharpener in 1985. Electric knife sharpeners are easier to use than a lot of people think. You don’t need to worry about the angle as it is all set for you already, so there is no guess work involved. All you need to do is use the weight of the knife itself to pull it through each slot and let the wheels do their thing. You cannot really go wrong using an electric knife sharpener. See the video below to see exactly how easy it is to use. The Wusthof 3 stage electric knife sharpener was designed especially for the Wusthof “Precision Edge Technology” (PETec) range of knives but will work with any other brand of knives as well. Furthermore, unlike the manual sharpeners, this electric sharpener will also sharpen serrated knives (in slot three). The RRP is $250 but can often be picked up on Amazon for a lot less. At the moment is it on offer for $187.95. This may seem like a lot of money to spend on a knife sharpener but this will last you a lifetime. If you are a heavy user of knives you will especially appreciate it as sending your knives off for professional sharpening adds up pretty quickly. 1. In the first slot the coarse diamond grit wheels are used to prepare the edge of the knife. Run your knife through this slot to set the new edge. The wheels in this slot are set to 14°. Pull the knife through this slot for 3 sets (3 swipes on each side of the knife). 2. The second slot has a finer diamond grit wheel, which along with the precision angle guides produce a razor sharp knife edge. The wheels in this slot are set to 14°. Pull the knife through this slot for 2 sets (2 swipes on each side of the knife). 3. Ultrafine stropping discs polish the edge of the knife blade. Pull the knife through this slot for 3 sets (3 swipes on each side of the knife). You use the slots in strict order – 1, 2, 3. For regular touching up of a knife, you only need use the third slot. Once the blade starts to need a little more attention use the second and third slots respectively. For knives that need a thorough seeing to, start at slot one. Depending on the usage your knives get, you may only need to use slot one, once or twice a year. 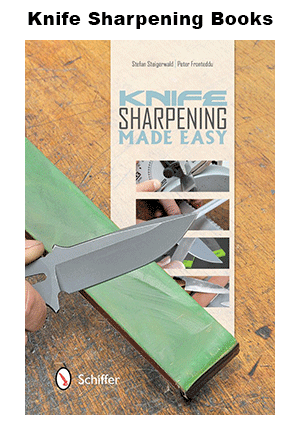 Sharpen serrated knives in slot three only. Using this electric sharpener will produce a knife blade as if it just came out of the factory. This video shows you exactly how to use this electric sharpener. Sometimes it is easier to understand by watching, so take a few minutes now to be clear exactly how to use this sharpener correctly, and how easy it is.